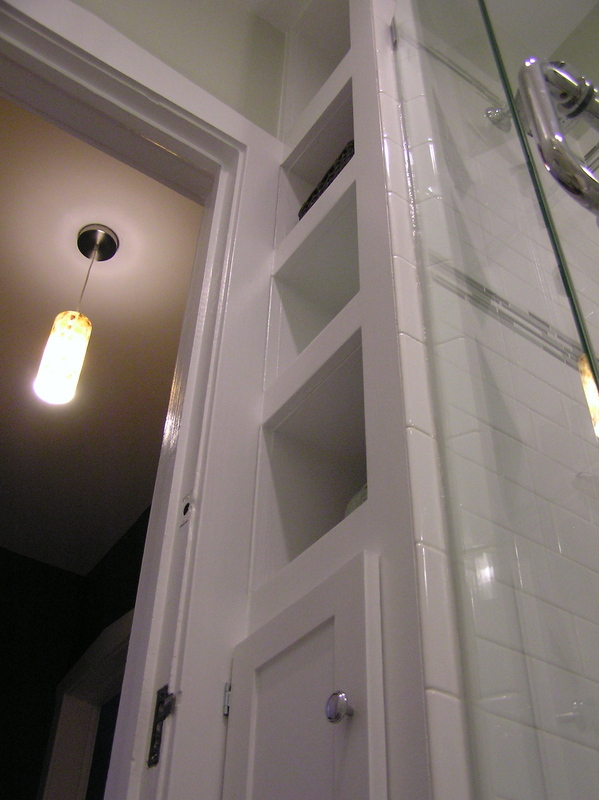 The awesome (if difficult to photograph) built-in cabinet & shelves in the new bathroom. The whole unit is only 12 inches wide (which means the shelves are only 9 inches wide), but it goes all the way to the 9 foot ceiling. 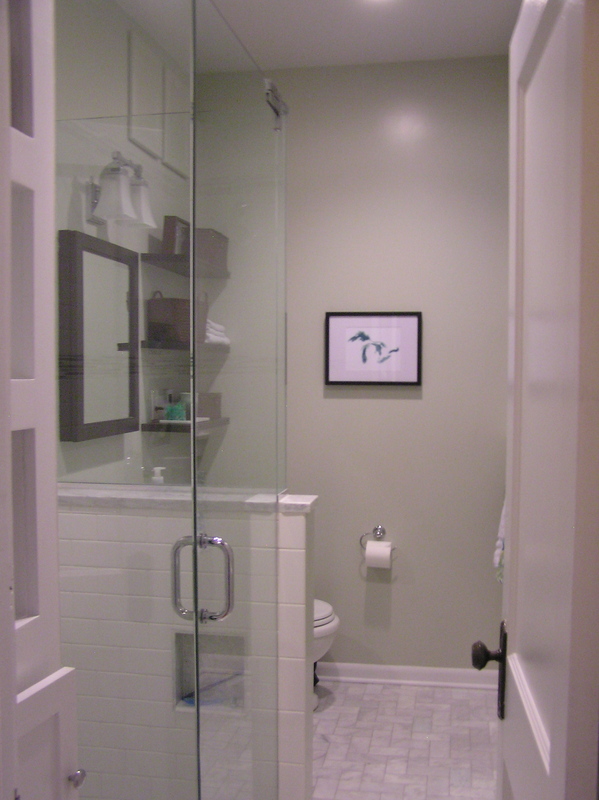 And all the way back too (well, 26 inches from the door to the wall…its a very narrow bathroom). 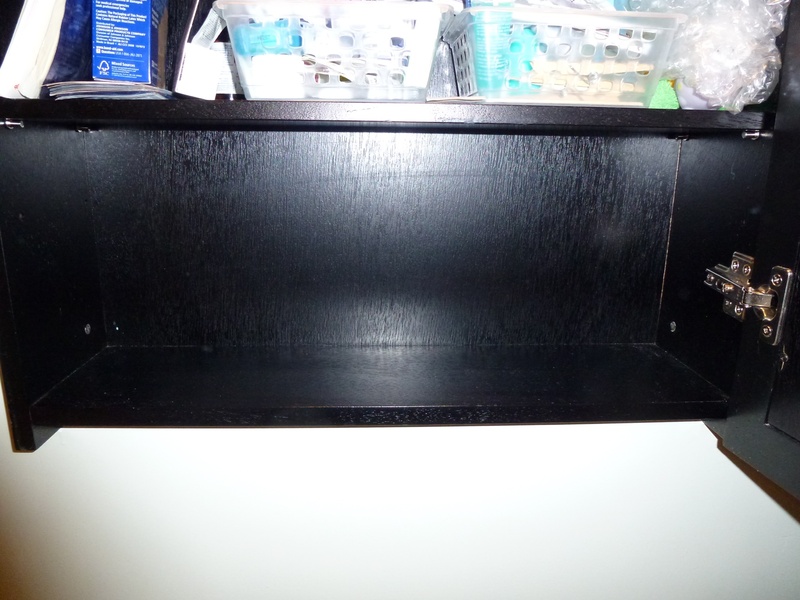 I have three shelves that are about 12″ high, and then the top shelf is about 24″, and then the cabinet encloses two more 12+” shelves. And the top one has toilet paper. I blame my father. He talked me into it when he took my sister and I to Costco. 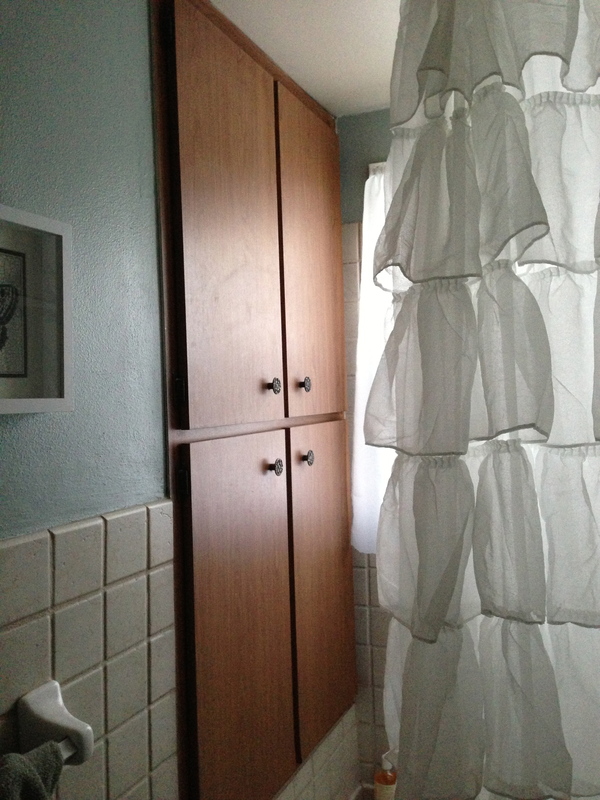 The high-up cabinet above those shelves–most people don’t even notice it, but its got beach towels and my old set of towels in it right now. I’m totally amazed at all the storage I managed to build in to such a small room. 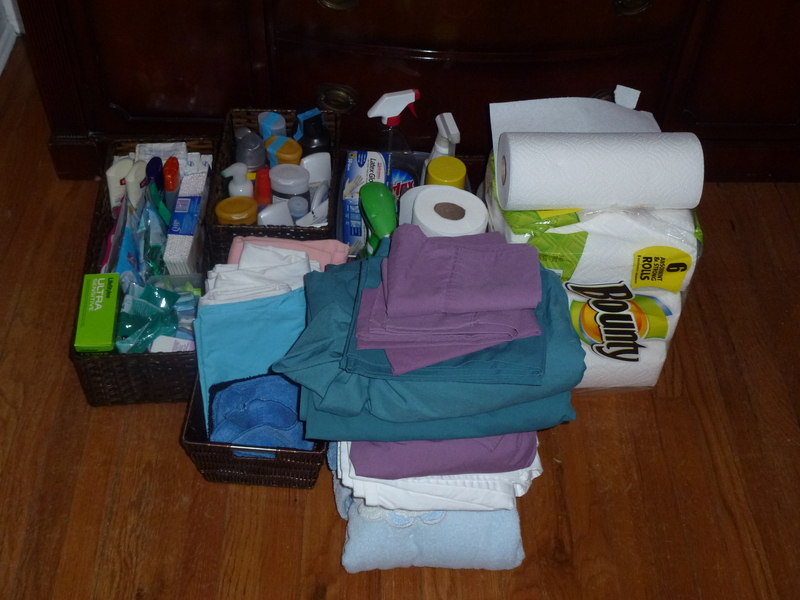 It freed up a ton of space in the hall (only) closet, and it doesn’t look crowded at all. I still miss having a real linen closet, but this is not bad at all. 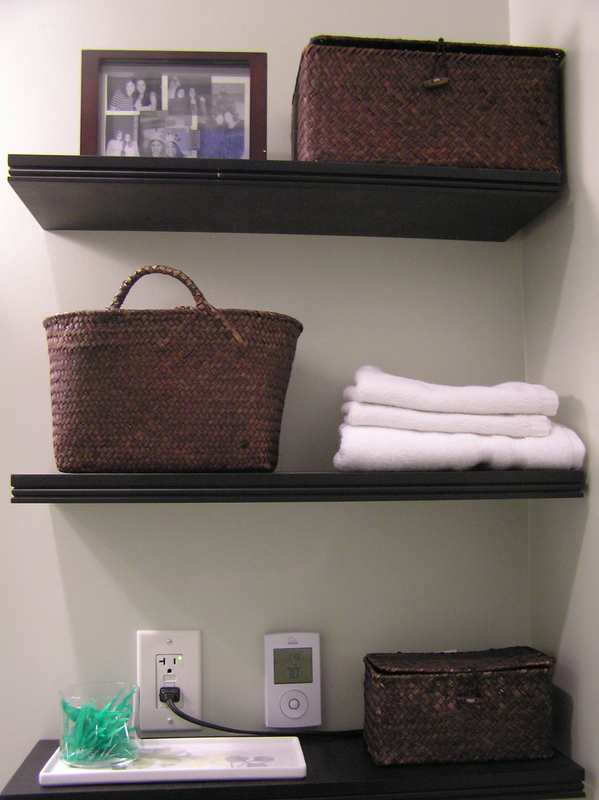 Do you have a linen closet? 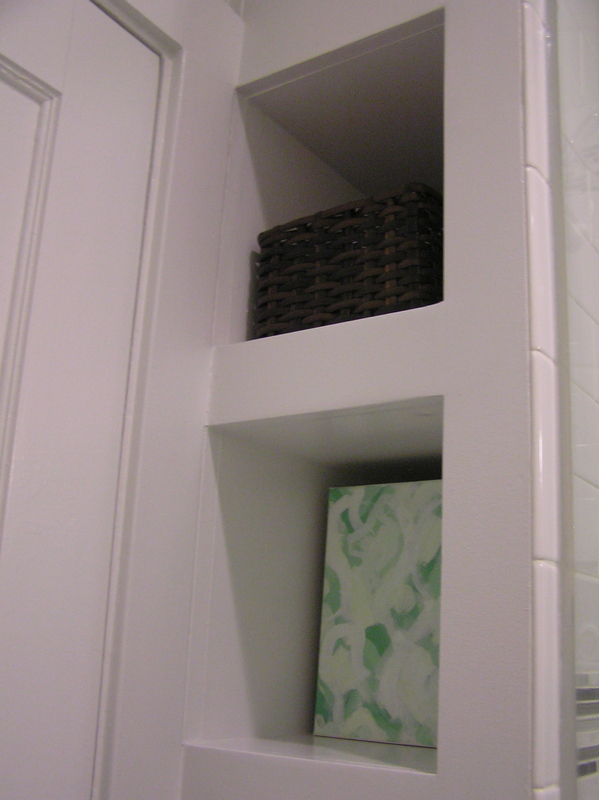 Where do you store all your bathroom stuff? This is a short little post on a little bitty thing. But sometimes those updates are the most fun, so I’m sharing anyhow. I’m loving the new bathroom, but still having a minor issue. That. Not just the part where it isn’t the tidiest, but the part where I can’t actually see things in there very well. 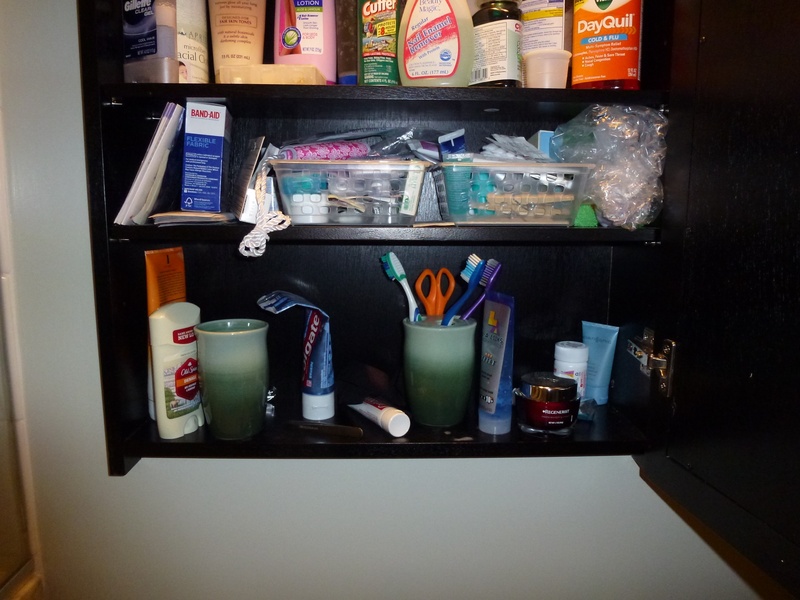 My old medicine cabinet had a white interior, and I could see things in it. This one? Not so much. When I wash my face or brush my teeth I put my hair back in a headband and ponytail, so I leave those two things in there. Both are black. They’re on the bottom shelf. See them? I can lean all the way over and look close and I still can’t see them half the time, and it was driving me nuts. 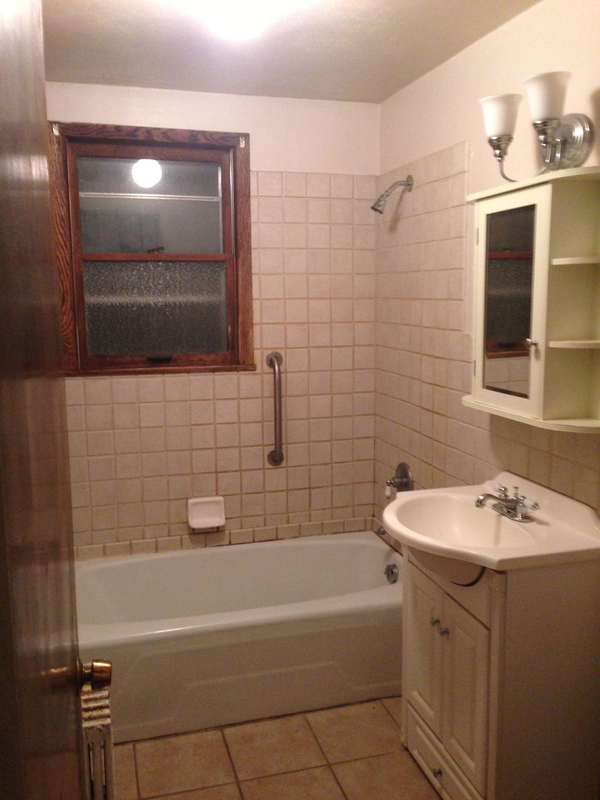 The surface is also wood, and I worried that drippy toothbrushes and the like would hurt the wood eventually. Now can you find my headband? Yep, me too! 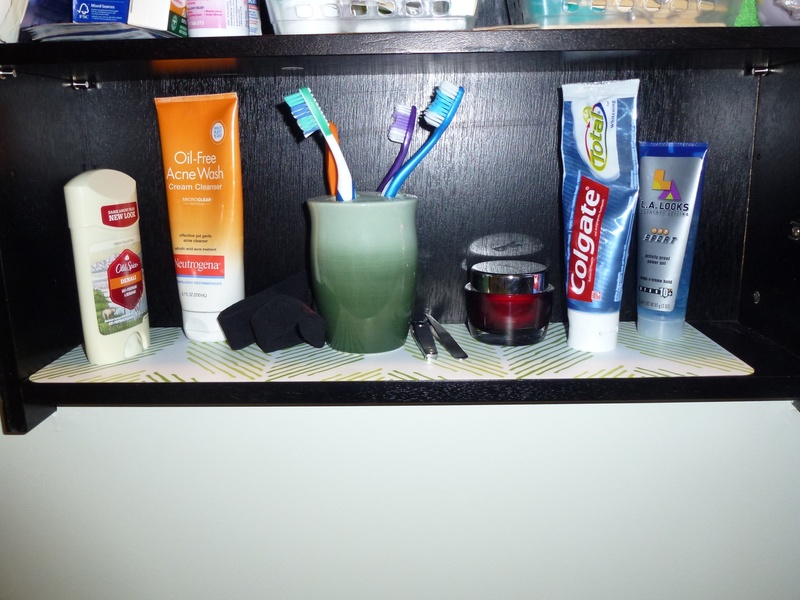 (It’s just to the left of the toothbrushes). If the mat gets dirty or sticky or anything, I can just pull it out and wash it off, leaving my medicine cabinet like new and me able to find my headband at 6 am! This isn’t my first Target placemat use–I have a couple in my kitchen for things like the bottom of the baking pan cabinet and underneath oils. Super easy, cleans up and if it gets too dirty I can just toss it out and my cabinets will be none the worse for wear! They cost about $2 and although the designs change, they always seem to have these in stock. 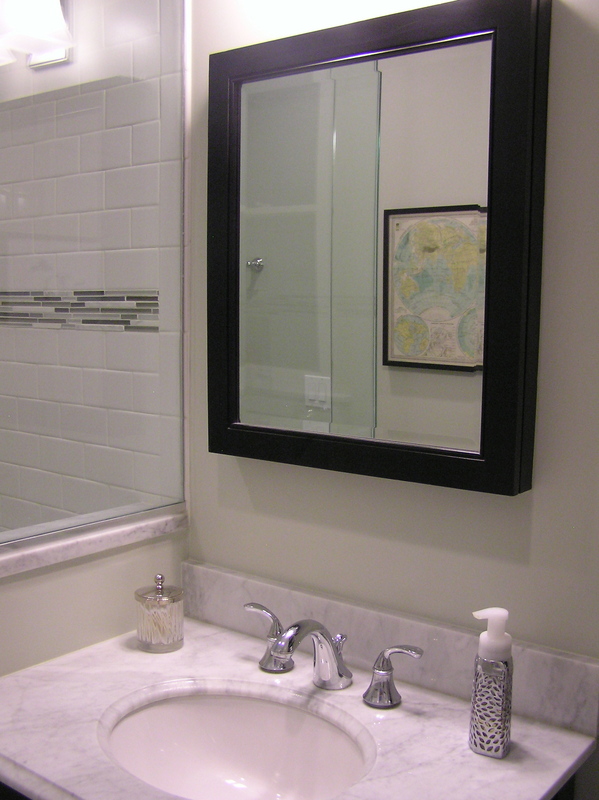 Do you line your medicine cabinet? 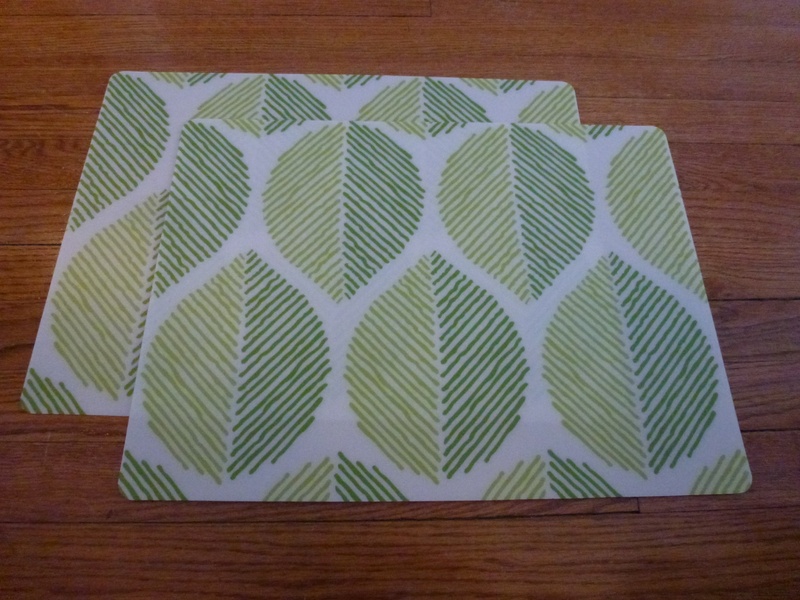 Ever used a placemat for an unconventional purpose? 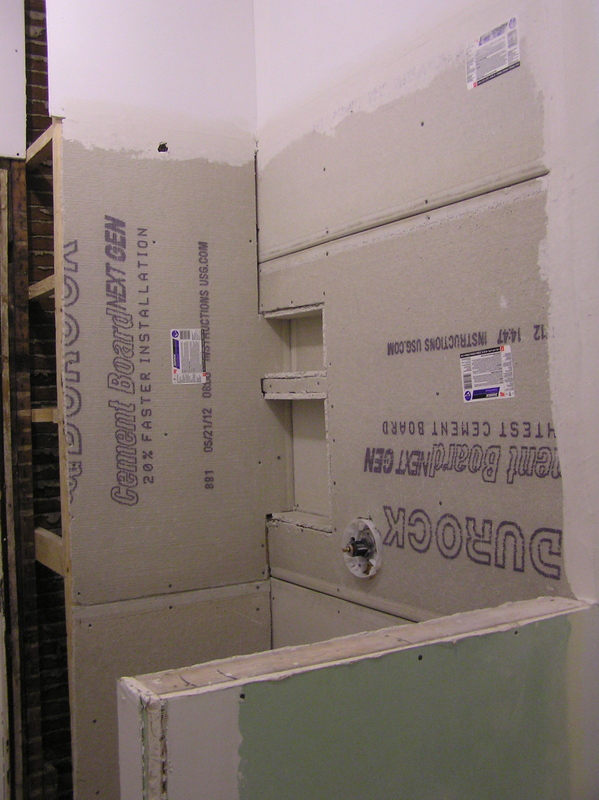 After never–ending work on my new bathroom, it was promptly flooded and (parts) had to be redone. It was pretty upsetting, and it turns out that my neighbor has bargain-basement “insurance”–good thing I have State Farm. 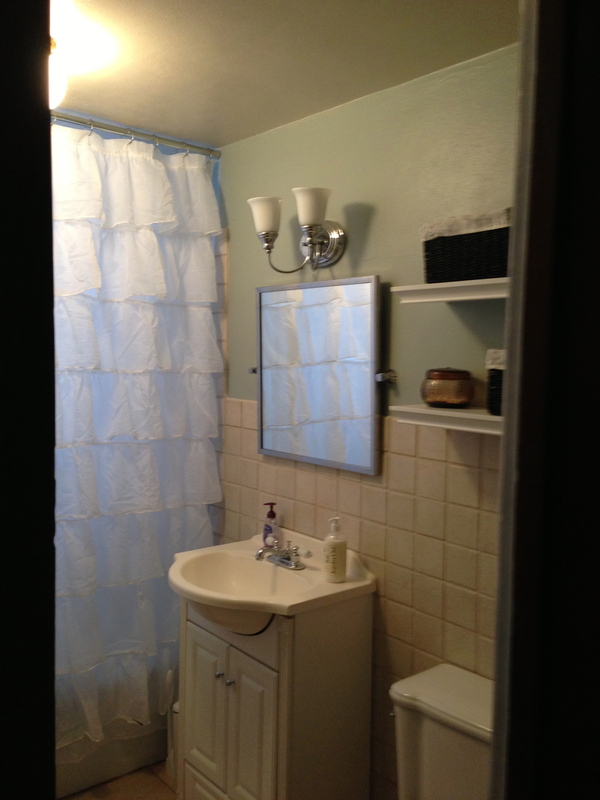 Due to a number of things, including discovering additional damage that meant tearing out the shower floor and redoing it, the bathroom was only fully finished LAST WEEK. 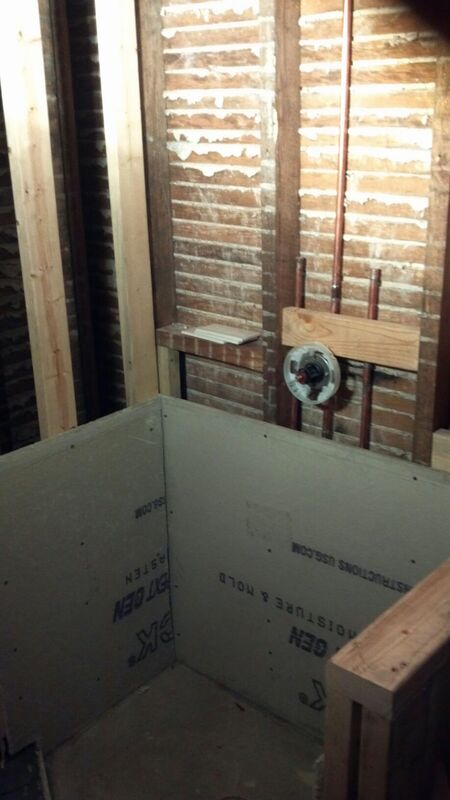 For those of you keeping track at home, that makes it FIVE MONTHS of not having a completed bathroom. Ugh. But finally FINALLY it’s finished. 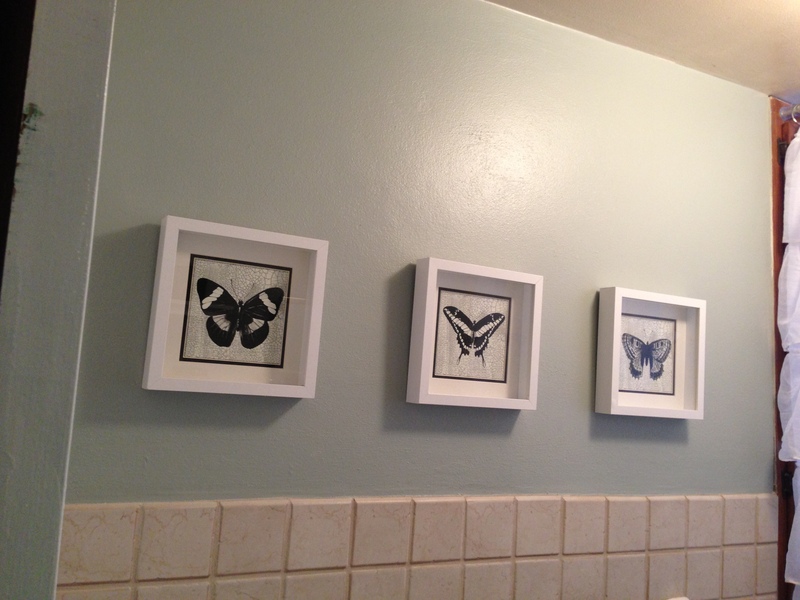 Art on the walls, boxes on the shelves and towels on the hooks DONE. 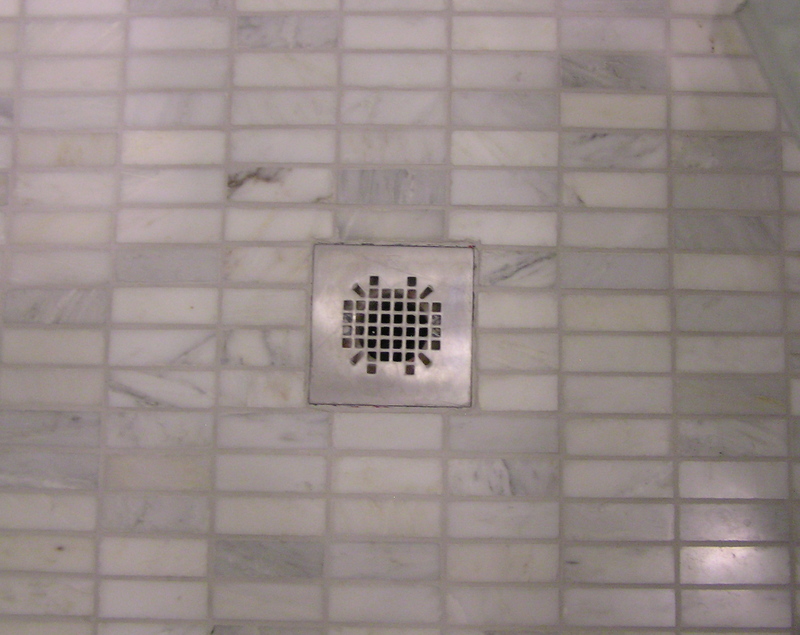 Shower floor tile is 1×2 marble tiles that look like minis of the floor tile. 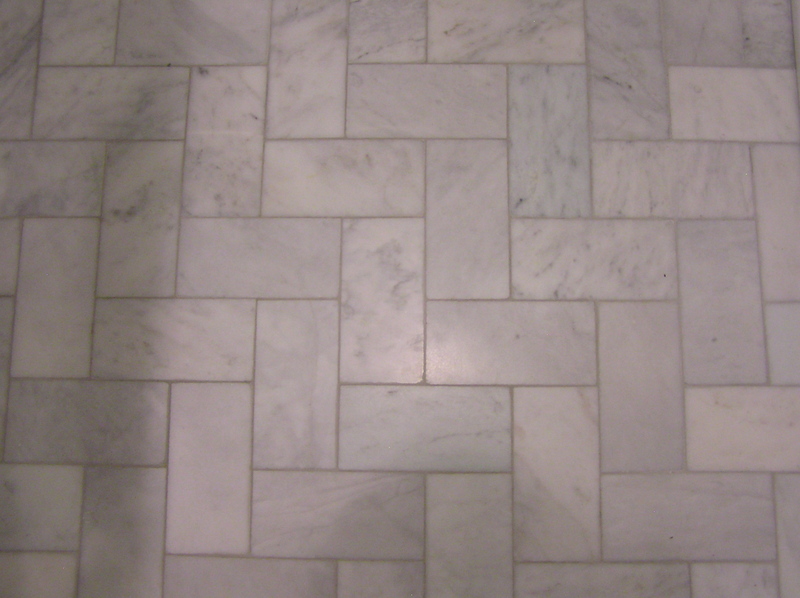 The bathroom floor is marble subway tile installed in a straight herringbone. Just enough interest without making the small footprint too busy. 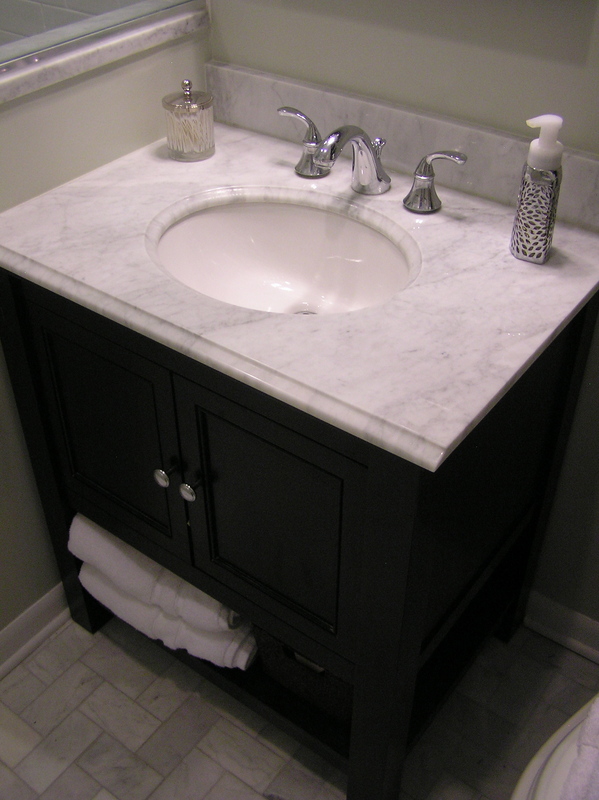 Between the open shelf on the bottom of the vanity and the cabinet, it has a ton of storage. 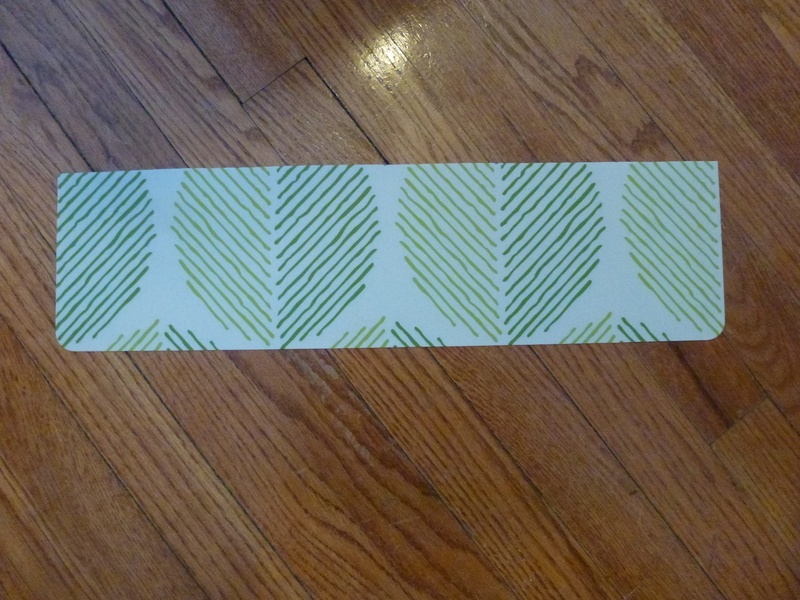 Pretty wrapping paper (with the perfect colors!) 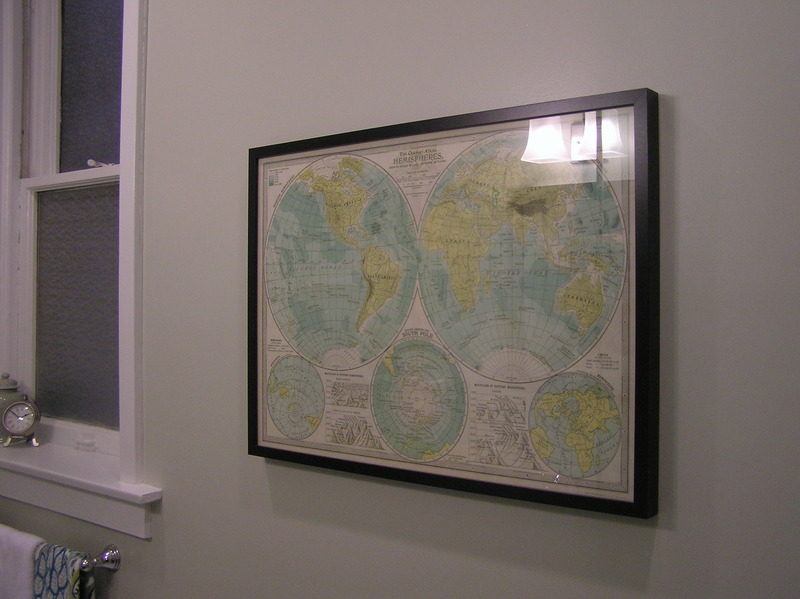 from Paper Source in an Ikea frame. Baskets on the shelves hide ugly chargers. 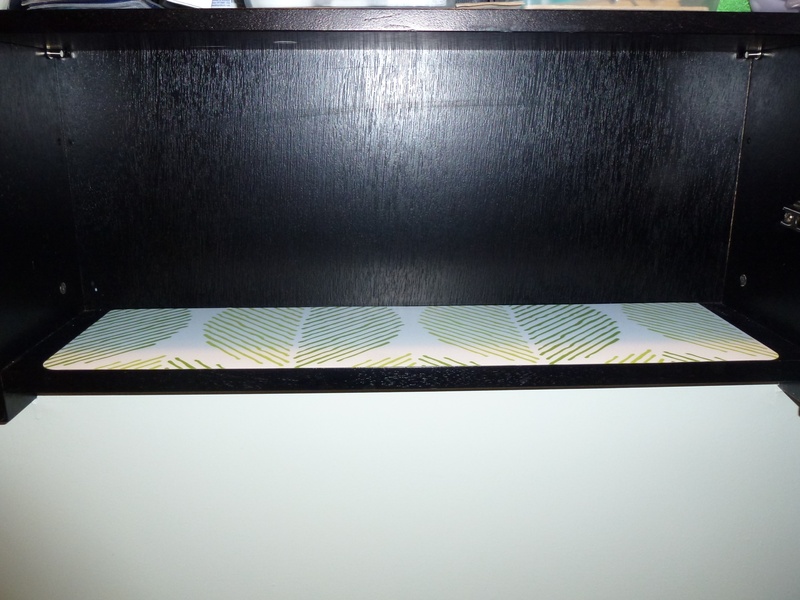 I also put the thermostat for the heated floors and the outlet ABOVE the first shelf, making them easier to cover up–and less distance for cords to have to stretch. 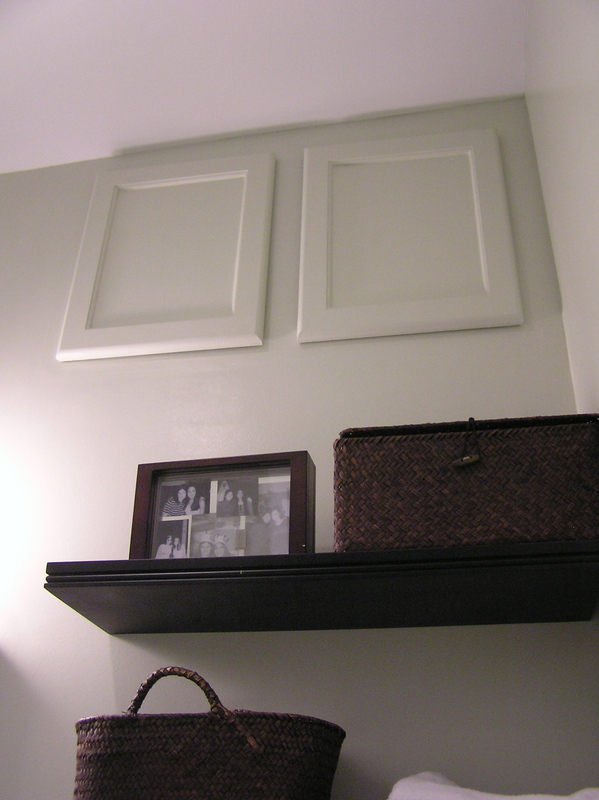 I put a cabinet in when we found a hole above where my coat “closet” ends…its tough to reach, but never say no to storage! Anything else you want to know? I can’t tell you how relieved I am to have this finally DONE. …sometimes the rain falls in your house. And it is NOT. GOOD. 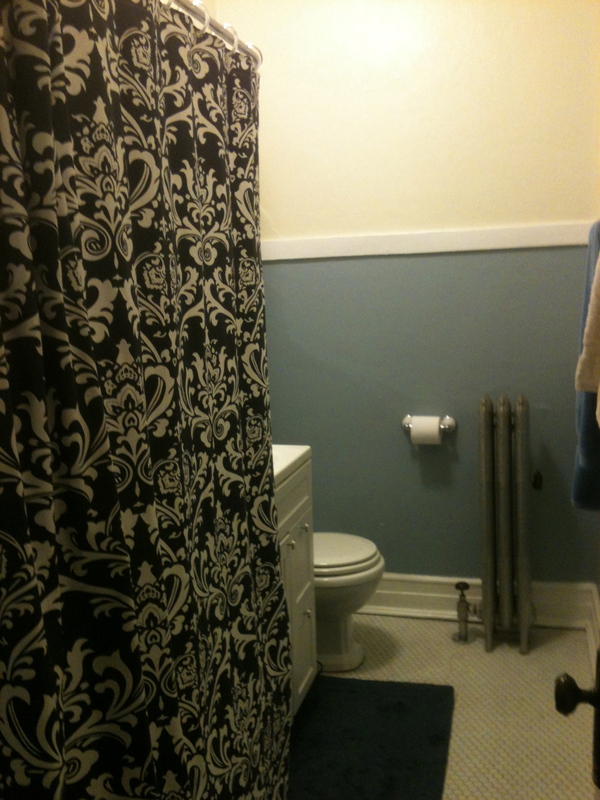 This should be a final reveal of my new lovely bathroom. Except it isn’t. So I got myself out of bed, confirmed no one was in the bathroom but water, turned a light on and…promptly flipped it back off. Because water was pouring through it. My upstairs neighbor somehow overflowed her toilet (I’ll let you put the 2:15am pieces togethere here) and caused a whole lot of water to come through a whole lot of places into my house. I was up over an hour that night putting out bowls, ran late the next day, and generally did not have fun. There doesn’t seem to be any significant damage to the bathroom, the water has stopped, and her insurance will cover the damage. 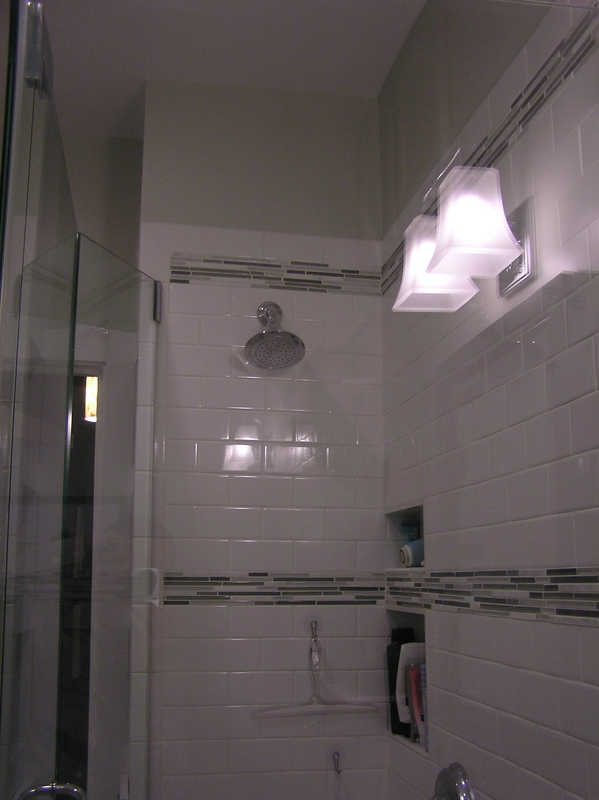 But grabbing bowls, having water come through your (also new) hallway light fixture for over 2 days and not being able to close the bathroom door (ahem, still) are not my idea of fun. But it really could have been worse. I was home. I woke up. I stopped a lot of damage before it happens, including water sitting on my radiant heat floors. Life will go on. It just wasn’t what I wanted to be talking about here. 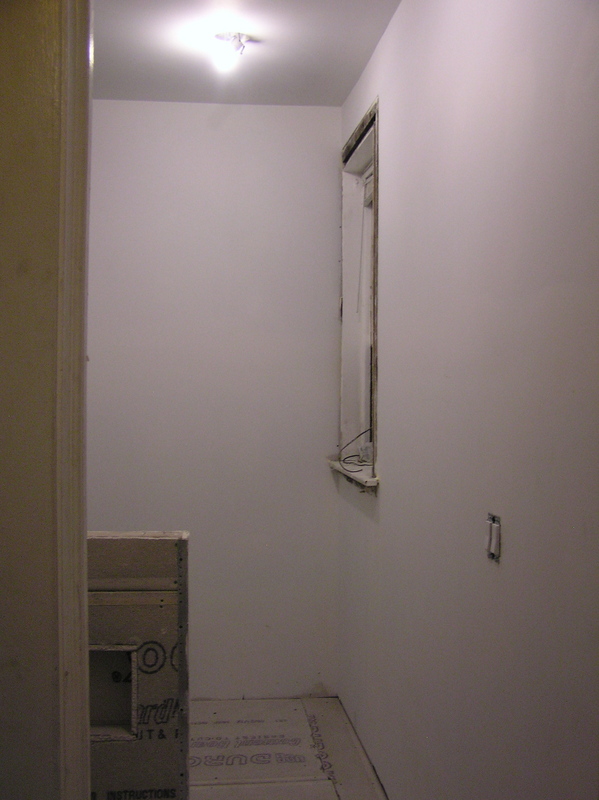 You can see some nice demo pictures of the hallway Lesley and I painted back in January. It will get repainted now, same color. It will be smoother. But mostly it will be the same, and my house will get dusty and dirty and have random people in it again. I’m not exactly excited. 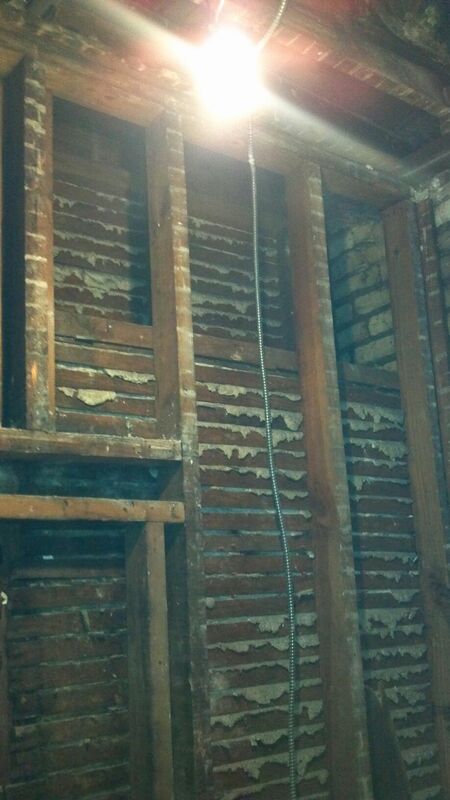 Have you ever had water pour through your ceiling? Oddly, this is at least my fifth time, although my first in this place. 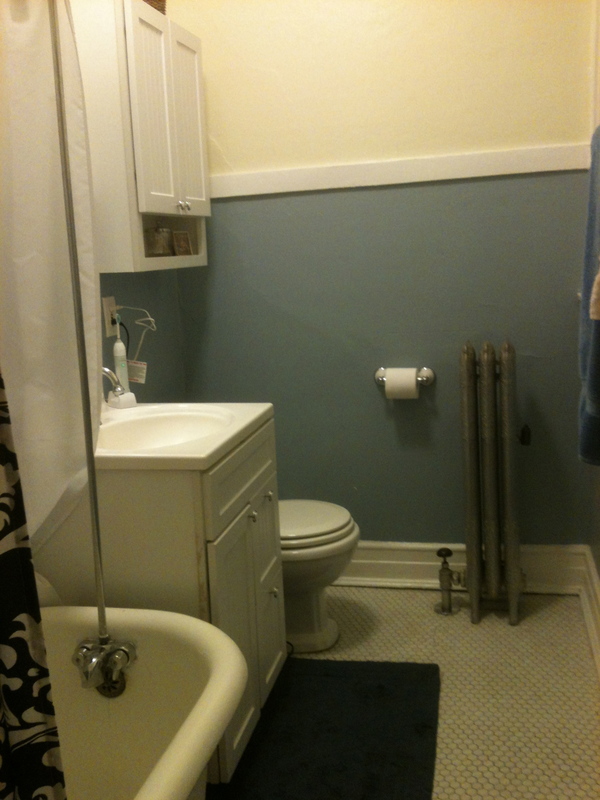 A Better Bathroom…is so so close! 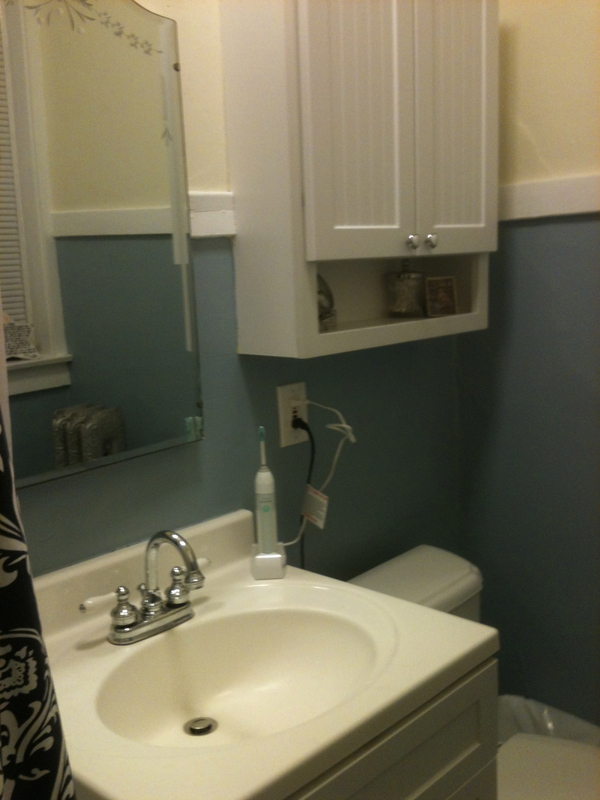 That hole above the medicine cabinet (in the last picture)? 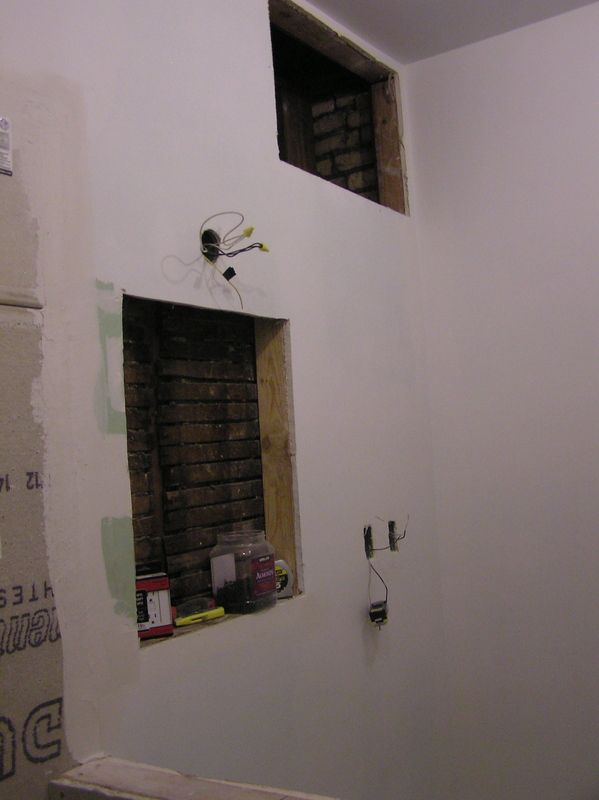 There’s random empty space in the wall about 7 feet up, above the top of the coat closet on the other side of the wall. Its going to be a bonus cabinet. Stay tuned! You are smart enough to determine everything else you aren’t seeing here. Things you also aren’t seeing? 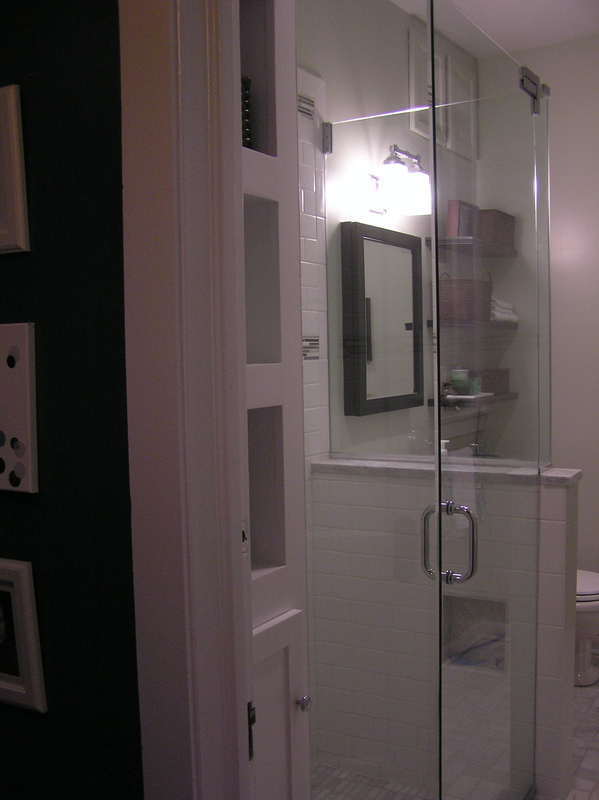 Have you done any major renovations? How long did they take? 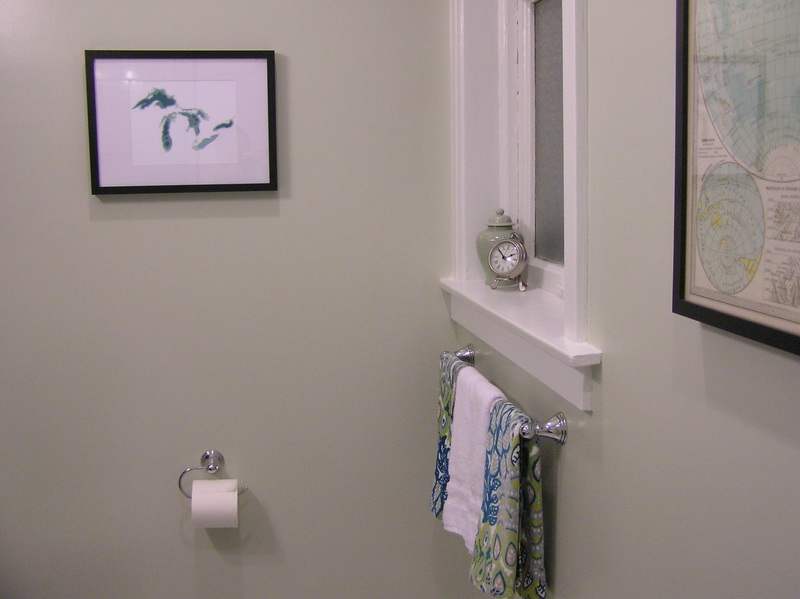 Can normal people live without a toilet? !